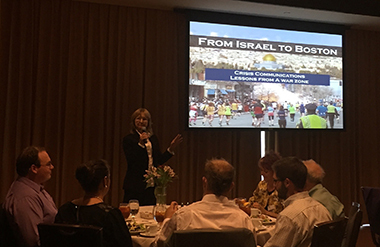 President and Lead Trainer, Karen Terrill shares crisis communications techniques we learned in Israel, and how they save lives right here in the U.S. Our workshops are enhanced by these hard-won lessons. "Go Book" Wins Crystal Award! The International Association of Business Communicators (IABC) has awarded the coveted 2009 Crystal Award to Media Survival Group for the Go Book. Said one judge: "Bravo! Great organization and useful tool that feels like a book that should always have been around." In addition to being excellent trainers, each member of "The Group" has years of experience in crisis communications. They don't recite theories and abstract concepts. Our highly skilled instructors have served in the trenches during some of the nation's largest disaster situations and they bring that expertise with them to each workshop. In addition to a traditional media component, our constantly current PIO Team JIC/JIS Workshop instructors will walk you through the latest developments in the hottest high tech tools available (such as Facebook, Twitter, LinkedIn, RSS, blogs and podcasts) to help your organization get your message to your target audiences.